Product prices and availability are accurate as of 2019-04-01 22:44:30 EDT and are subject to change. Any price and availability information displayed on http://www.amazon.com/ at the time of purchase will apply to the purchase of this product. The Portable Waterproof Baby Diaper Changing Pad Liners You've Been Needing! Non-slip backing makes sure the changing pad stays in place and, thanks to non-plastic material, you don't have to worry about it peeling when you put it in the washer or dryer. What exactly makes our changing pads different? 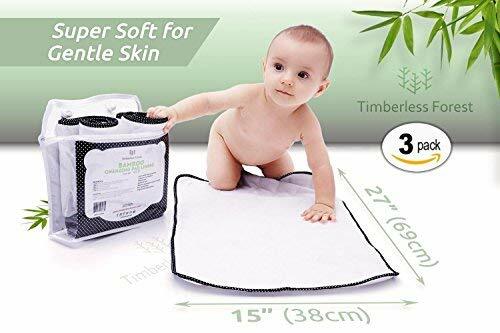 → 15" x 27" make them more practical than smaller diaper changing pads. Timberless Forest knows a thing or two about babies and even more about taking care of parents. Always on-the-go parents need solutions that work for an active lifestyle without sacrificing the well-being of the environment. We're committed to creating non-synthetic, all-natural products that are top-notch, stylish, practical, and durable. By using sustainable organic materials, like bamboo, we help busy parents like you feel good about the products they use every day. Our set of 3 baby changing pad liners are made out of bamboo rayon, which is a hypoallergenic, antibacterial, and super soft and comfortable for even the most sensitive baby skin. We offer a 100% satisfaction guarantee, if you are not satisfied with your purchase, contact us for full refund or replacement. See why parents are trusting Timberless Forest and click "Add to Cart" now! SUPER SOFT FOR GENTLE SKIN. Our soft quilted baby changing table covers are safe for sensitive skin and are warm even on cold surfaces. 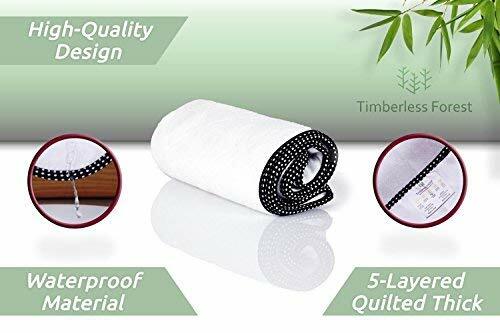 Thanks to Bamboo Fiber, our organic portable changing pad liner are hypoallergenic, breathable and antibacterial. WIPEABLE AND MACHINE WASHABLE. Toss our reusable liners in the washer and dryer. The non plastic material won't peel. Our design ensures messes won't leak through. Also our changing table topper is easy to clean with baby wipes while you're out. DIAPER CHANGING PAD FOR EVERYDAY USE. Timberless Forest's multipurpose thick sheet savers aren't just for baby changing tables or changing table dresser. Use our pack n play mattress sheet, lay them down in the floor or in the crib for diaper changes. Use them in strollers, play yard, and as play mats at the park. Thanks to our black and white cute polka dots modern pattern, they're the perfect baby shower gift for the New Born. PORTABLE CHANGING PAD. We know you're on the go. Take our travel changing pad with you everywhere thanks to their super compact design. Great for outdoor adventures and travel in the car. CAMBIADOR DE BEBE PORTATIL. Su diseño es ideal para usar en cunas, porta bebés, en el coche, cambiadores en baños públicos o en cualquier aventura con la familia. A prueba de agua gracias a sus 5 capas que evitan la filtración de líquidos. Nuestros tapetes para cambiador de pañales están hechos de bambú, material orgánico y ecológico, lo que los hace más suaves, hipoalergénicos y antibacteriales. Se pueden meter a la lavadora y secadora. Son fáciles de llevar a cualquier parte.